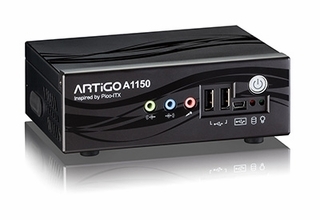 The VIA ARTiGO A1150 DIY PC Kit packs VIA Eden X2 dual core processor, HD video and HDMI support for a rich multimedia experience in an ultra compact chassis. The VIA ARTiGO A1150 is an ultra compact sub-liter DIY PC kit for enthusiasts who do not want to sacrifice size for computing power. 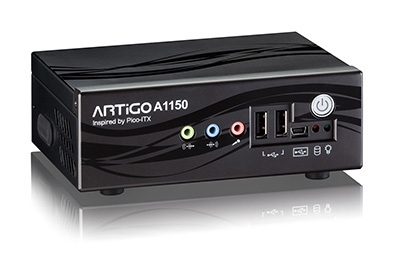 Taking inspiration from the Pico-ITX form factor, the VIA ARTiGO A1150 squeezes in a range of features that include a full 64-bit dual core processor, HD video support, HDMI and VGA display connectivity, full Gigabit networking, up to 4GB of DDR3 memory, Wi-Fi Support and five USB ports, all into a palm-sized PC chassis. The VIA ARTiGO is one of the smallest full featured PC Kit on the market today. With dimensions of a mere 14.6 x 9.9 x 5.2cm (5.7" x 3.9" x 2"), totaling only 725cm3, this mini PC is suitable for a myriad of applications in the home or office, including home server, media streaming and surveilLANce applications. The VIA ARTiGO A1150 is also great as a straightforward desktop PC, taking a fraction of the physical real estate. Powered by a dual core 1.0GHz VIA Eden X2 processor, the VIA ARTiGO A1150 offers a high performance native 64-bit computing experience while remaining within a low power thermal envelope. Front and back panel I/O includes HDMI and VGA ports, a Gigabit Ethernet port, four USB ports including one micro-USB port, three audio jacks and an optional integrated wireless IEEE 802.11 b/g/n. Hard drive, compact flash module, solid state drive, SD card, wireless module, antenna, system memory and operating system must be purchased separately. Based on the IEEE 802.11b/g/n specification, wireless network access requires base station or other wireless access point; fees may apply. This barebone storage PC system is covered by limited warranty. Product specification is subject to change without prior notice.